The UCU congress should have been a council of war for the struggle to come. Eyewitness report from Gaza: "Razan was killed in front of my eyes"
Delegates to the RMT transport union's special general meeting (SGM) have voted to maintain the union's current political strategy and not to affiliate to the Labour Party. Nationalise rail - don't delay! : Northern rail cancelled more than 250 trains entirely on 29 May. Where trains run at all they have been up to two hours late. Donald Trump, in rebooting his presidential campaign slogan to "Make America Great Again" is attempting to do this on the backs of the rest of the world, by introducing tariffs on US imports. A general strike and huge demonstrations of an unprecedented scale have shaken the Jordanian kingdom, against the backdrop of a steep rise in the cost of living and government corruption. West Midlands firefighters have voted by 90% to take strike action against exploitative conditions for new fire service workers. They are being introduced by the Labour-led West Midlands Fire Authority (WMFA). Tower Hamlets Unison members started strike action for fair pay on 4 June. The People's Assembly met for its annual conference on 2 June, with a series of workshops and rallies, but with no democratic decisions being made. 200 years since the birth of Karl Marx - come and walk in his footsteps! 2018 marks the 200th anniversary of the birth of Karl Marx, who shaped much of 20th century history. Nonfiction - 12 Rules for Life: an Antidote to Chaos: The publication in January of Jordan Peterson's '12 Rules for Life', with recent appearances on British and international television, represent an advance for tired but dangerous arch-conservative ideas. Fiction: The Spinning Heart: I have only recently caught up with Donal Ryan's wonderful, inventive 2012 debut novel about the brutal and shattering effects on a rural Irish community following the financial meltdown of 2007-08.
Letters to the Socialist's editors including jailed TUSC agent Chris Fernandez and the shallow liberal press. Three months after the general election of 4 March, Italy has a government again. On 1 June, the 'yellow-green' government was officially installed. Workers in the PCS union, representing civil servants across all government departments, have voted overwhelmingly to ballot members for strike action. PCS members in DWP say: Pay up now! PCS members in the DWP were outraged that a previously-agreed pay rise was being delayed. UPDATE on 14.6.18: DWP senior management backs down! 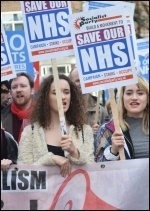 Four Yorkshire branches of health union Unison are balloting simultaneously for strikes against plans to transfer estates and facilities workers into separate companies - owned by NHS trusts, but outside the NHS. By 2020 there will be nil central government funding to Transport for London. To fight the cuts we need to use every means we can, including preparing for industrial action by bus workers across London, and coordinated action with other TfL unions. Tower Hamlets Community Housing workers are in their second week of strike action organised by public service union Unison. Their new pay structure is not negotiated with the unions, but based on 'market testing'. Napo is struggling to make a significant difference to the working lives of members. In five years, the incumbent, Ian Lawrence, has been unable to stop a decline in membership, and it is time for him to step aside. 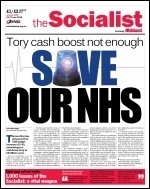 Stoke Socialist Party will be asking people if they want to pay for their copy of issue 1000 now and they will deliver it to them in that week. In the words of Amber Rudd, "no one died at Orgreave"
The fact that 87% of voting members in GMB, one of the smaller health unions, rejected the deal shows what could be achieved had there been a united campaign to reject. Instead health unions have signed off for three years just as other public sector workers are gearing up to fight. The horror of the Grenfell fire happened a year ago, on 14 June 2017. The whole neoliberal housing model has failed. Time won't heal capitalism's crimes, but working class action can win safe homes for all. 15,000 on far-right march: It is time for the left unions to act. How can we fight for trade unions that fight for women? All measures to increase participation of women fighters in the unions are welcome. But being a woman doesn't automatically qualify someone to represent women. Civil service pay strike ballot: vote yes! Interview with PCS assistant general secretary Chris Baugh: After years of real-terms pay cuts, the PCS is balloting to strike for a fully funded, above-inflation increase. Press leaks suggest Rolls-Royce in Derby is set to announce another 4,000 job losses. Immediate meetings of the entire workforce should be organised to discuss how to fight the proposed losses. Elon Musk, the capitalist and engineer behind Tesla and SpaceX, has claimed he is a socialist - unlike Karl Marx who is apparently a capitalist. Because he "wrote a book about it." Cardiff Central Socialist Party: What is fascism and is it a threat today? How do we produce the Socialist? NHS and ambulance service reps in the GMB union from across the UK met on 15 June. This was held in response to GMB members rejecting the governments' NHS pay offer. The 100th annual conference of the Bakers, Food and Allied Workers Union (BFAWU) was held in Southport from 10-14 June. Northern Rail workers in transport union RMT took their 21st day of strike action on 19 June. Train bosses want to implement 'driver-only operation' (DOO) - removing the safety-critical role of guards. Unite agrees NSSN affiliation - come to the NSSN conference! Parents involved in the Disability Empowerment Action Links (Deal) group have pushed Leeds City Council into 'pausing' its plans to cut special education needs transport to over-16s. Heartless Tory-run West Sussex county council is proposing to close the much-needed Wrenford Centre in Chichester. The right-wing Labour group in Knowsley council, Merseyside, has been forced into a climbdown on two important measures. Greetings from readers of the Socialist and from campaigners and trade unionists thanking the paper for supporting their struggles. Donald Trump's decision to withdraw from the non-binding Paris climate change agreement was not only a major defeat for even this weak attempt at tackling global warming, but also an example of his continuation of protectionist and isolationist policies. On 14 June senior managers in the Department for Work and Pensions (DWP) caved in to the PCS civil servants' union's demands that they pay the contractual 'employee deal' pay rise on time in July. On 16 June in central London Socialist Party members took part in Solidarity Day 2018 - an annual event organised by Tamil Solidarity. Grenfell disaster: one year on, still no prosecutions, still no adequate housing..
A silent sea of people wearing green marched through the streets of Kensington and Chelsea on 14 June. Film: The Young Karl Marx (2017): Director Raoul Peck takes us on a voyage through the life of 'The Young Karl Marx'. Theatre: Marx in Soho: For socialists, a one-man show about Karl Marx might not suggest a night of revelations. But seeing Bob Weick performing Howard Zinn's play 'Marx in Soho' in Manchester on 9 June showed this was a misconception. Fight for liveable benefits, real support and decent jobs: The government's flagship welfare reform, Universal Credit, has been well and truly savaged by the National Audit Office. Recent reports show there is an increase in the number of suicides among refugees in the UK. The latest additions to that number are three teenage refugees from Eritrea who have taken their own lives in London. Rolls-Royce: fight all job cuts! The job losses announced at engineering giant Rolls-Royce are a massive blow to Derby. Like everywhere else, full-time, secure jobs have long been disappearing leaving largely insecure, low-paid work in their place. Unite union conference - drive out the Tories! The Trump White House reached a new low in recent immigration policy. One resident said: "I can't understand how a Labour council can even consider allowing a company to build this type of plant only hundreds of metres from people's homes!"